Marking their 13th straight record-setting month, Audi is reporting today the company's best-ever January U.S. sales. Counting a total 9,354 vehicles sold for the month (a 19.7% increase over the same period last year), Audi appears to be on track for yet another record setting year in 2012. "Consumers are sending a strong signal that Audi is at the top of the luxury vehicle market," said Audi of America President Johan de Nysschen. "I’m optimistic that 2012 will be another pace-setting year." Full report after the jump. HERNDON, Va. February 1, 2012 - Audi today reported its 13th straight record-setting month of sales with 9,354 vehicles sold in January 2012, topping the 7,812 vehicles sold in January 2011. Year-over-year vehicle sales increased 19.7% over 2011, the previous record set a year earlier. January results were buoyed by strong performance in the C and D segments, with sales for the technologically advanced Audi A6 increasing 90% over 2011, the Audi Q7 luxury SUV sales increasing 15%, and strong sales of 643 vehicles for the design-forward Audi A7, which was launched in the U.S. market in April 2011. 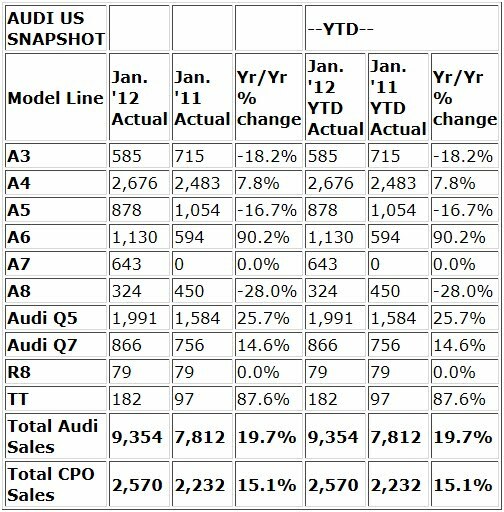 • January 2012 ranks as the best January in Audi of America history, eclipsing the previous record set in 2011. • 2012 Audi A6 sales up 90%, compared to January 2011, and bolstered by 98.6% year-over-year sales increase in the sedan model. • Audi TT sales up 88% vs. January 2011, boosted by increased demand for the Audi TT RS Coupe. • Audi Q7 sales up 15%, compared to January 2011. • Sales of Audi Q5 increased 26% in January 2012. • Sales mix for Audi TDI clean diesel models finished the month at 67.2% for the A3 TDI, 35.8% for the Q7 TDI. • Audi Certified Pre-Owned sales of 2,570 vehicles mark an increase of 15% over the same period in 2011. • For the record-setting month of January 2012, four Audi models recorded year-over-year sales increases of 15% or more, including the Audi A6, the Audi Q5, the Audi Q7, and the Audi TT model range.